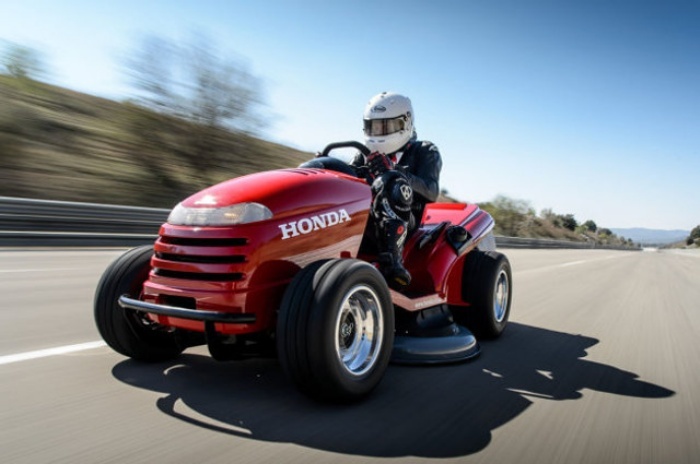 Honda's Mean Mower Clocks In At 116MPH | OhGizmo! Honda’s Mean Mower is exactly what its name implies: mean. It’s exactly that as it speeds down the road at a whopping 116MPH. Honda didn’t exactly make this for people to use on their front lawns, because God knows what you’ll cut or how you can mow when you’re moving at that speed. Rather, it was made to break a world record–and break a record it did, as it is now officially the record holder for world’s faster lawnmower. The Mean Mower is actually a modded, souped-up version of the HF2620 Lawn Tractor tweaked by the British Touring Car Championship squad Team Dynamics. That reminds me. I need a faster robotic lawnmower. The Mean Mower has a newly fabricated chassis from 4130 chromoly steel and packs a 1.0-liter engine from a Honda VTR Firestorm motorcycle with a six-speed sequential gearbox. The engine produces 109 horsepower and 71 pound-feet of torque. To claim the record, the lawnmower had to run through a 100-meter speed trap, and it had to make two passes in opposite directions within an hour with the average taken between them.